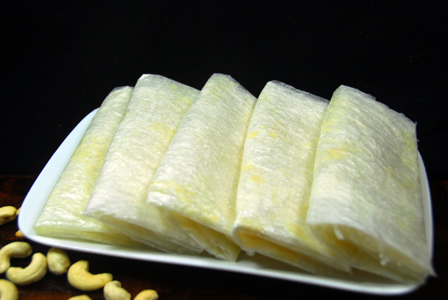 Poothareku is a famous coastal Andhra sweet made with thin flaky sheets of paper made of rice flour. For cashew pootharekulu, cashew nuts are ground into powder along with sugar and is folded into the rice paper sheets along with pure ghee. Store the pootharekulu tight in a jar and they stay fresh for around a week or two. 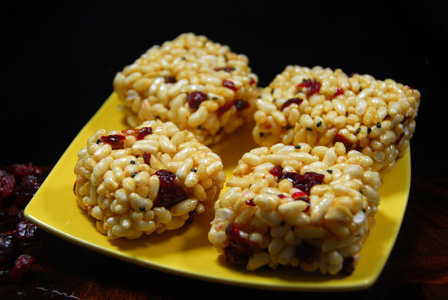 Makes: around 5 Pieces of Cashew Pootharekulu. Grind the cashews into fine powder along with sugar and remove onto a bowl. Layer around a tbsp of cashew powder onto the first rice paper sheet. Spread around another tbsp of cashew powder onto the second sheet. Spread around another tbsp of cashew powder onto the third sheet. Spread around another tbsp of cashew powder onto the folded strip. Store the cashew pootharekulu in a tight jar and serve when necessary. Variations: You can also layer finely chopped bits of cashews if desired. 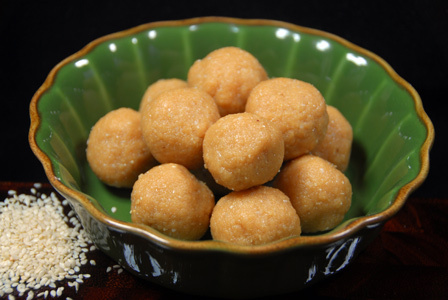 Bellam Pootharekulu made with grated jaggery. Other Names: Jeedi Pappu Pootharekulu, Cashew Pootharekulu. Raw cashews are soaked in water and ground into smooth paste. 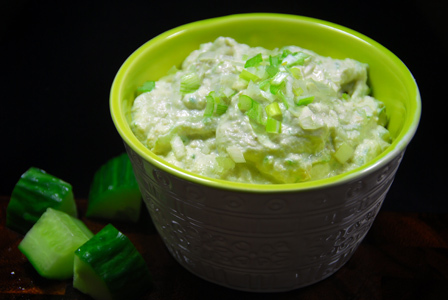 Cucumber is grated and mixed with the creamy cashew mixture along with scallions. Serve cashew cucumber dip with spiced tortilla chips or use as a spread on toast etc..
Peel, wash and remove ends of the cucumber. Chop half the cucumber into pieces and grate the other half. Squeeze the grated cucumber to remove any excess moisture. Soak cashews in water for atleast 4 – 6 hours. Drain the cashews and grind them into smooth paste along with chopped cucumber, salt. Remove the cashew paste onto a mixing bowl. In the mixing bowl, add chopped scallions, grated cucumber, lemon juice and salt. Adjust any seasonings if required and refrigerate. Garnish with scallions and serve cashew cucumber dip with spiced tortilla chips or sliced veggies or use as a spread on toast etc..
Notes: Make sure to grind the cashews well. Suggestions: Adjust the creaminess with cashews. Add more cucumber pieces for less creamy dip. Variations: You can add any sort of chopped nuts to the dip. Other Names: Cashew Cucumber Dip. Bitter gourd is thinly sliced and fried in oil till golden brown in color. A freshly ground mixture of grated coconut and cashews is added to the bitter gourd fry. Serve bitter gourd cashews fry with steamed rice and dollop of ghee. 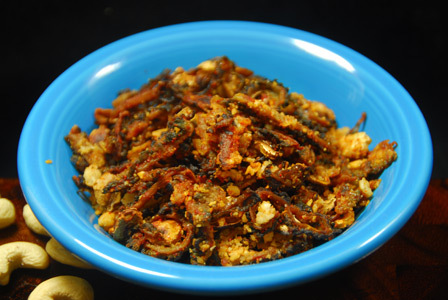 Makes: around 2 Servings of Bitter Gourd Cashews Fry. Lightly scrape, remove ends, wash and chop the bitter gourd into thin slices. Grind cashews into fine powder using spice grinder. Then add the grated coconut and grind again for few seconds and remove from heat. Heat oil in a pan, add sliced bitter gourd. Fry on medium flame till bitter gourd changes color and start to brown. Stir in ground cashews coconut mixture and salt. Mix thoroughly and fry for a minute or two and remove from heat. Stir in red chili powder and serve bitter gourd cashews fry with steamed rice and dollop of ghee. Notes: Make sure not to over fry the bitter gourd. Variations: Add a pinch of sugar along with red chili powder if you wish. Other Names: Bitter Gourd Cashews Fry.